FlagHouse, Inc. and CATCH Global Foundation are pleased to announce a partnership with Lakeshore Foundation – National Center on Health, Physical Activity and Disability (NCHPAD) and Special Olympics International to make physical activity programs more inclusive of youth with physical, sensory and intellectual disabilities. CATCH® (Coordinated Approach To Child Health) is the most cost-effective program proven to prevent childhood obesity and launch kids toward healthier lifestyles. The CATCH curriculum is designed to promote physical activity and healthy food choices for students in Pre K through Grade 8. 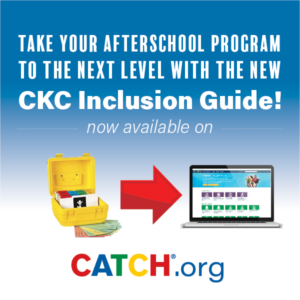 CATCH coordinates and reinforces healthy messages in schools, afterschool sites and early childhood centers. With the largest evidence base of any child health promotion program, CATCH is championed by educators and health professionals in over 11,000 communities worldwide. With support from Lakeshore Foundation – NCHPAD and Special Olympics International, FlagHouse and CATCH Global Foundation, the distributors of the CATCH program, will work to prioritize inclusion in current initiatives and programs starting with the CATCH Kids Club (CKC) afterschool curriculum. Special Olympics is the world’s largest sport and public health organization for people with intellectual disabilities. We strive to make health systems fully inclusive to ensure people with intellectual disabilities are able to lead healthy and meaningful lives. For more information about Special Olympics, please visit https://www.specialolympics.org/ . For more information about inclusive health for people with intellectual disabilities, please visit inclusivehealthcenter.org.